Lothlorien Cottage Self-cateringThis beautifully furnished self catering holiday home offers visitors a comfortable and cosy sitting room, a well equipped, sunny kitchen with dining area, and three comfortable bedrooms. The pretty garden has a patio area and barbecue and is a lovely spot for outdoor dining and large enough for children to play amongst the birds and butterflies. This self catering cottage in Wales is a home away from home lying opposite a wetlands reserve with views across to Mount Cawdor. with salt marsh lamb and black beef being local specialities. Lothlorien Cottage is a 4 + Star luxury cottage Which comfortably sleeps 5 people (3 bedrooms). Free Wi Fi.and private parking Family and Pet Friendly High chair and babycot available. 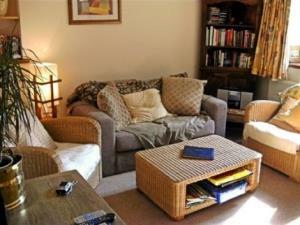 Cottage sleeps 5 adults and one child with the use of a babycot Children welcome from any age. Lothlorien Cottage offers weekly bookings starting on Saturday and sometimes short breaks.